Some may wonder what we are doing reviewing the Coincident Triumphs again, but these are the Triumph Signatures which have an improved crossover, higher quality tweeter and heavy duty gold plated binding posts mounted on high density acrylic plates. Youll pay another $200 for these extras, bringing the total up to $995 US per pair, $1,249 with optional veneer. To start, I have to relate the story of picking the Triumphs up at Israel Blumes location. He is quite a character, who obviously has a passion for high end audio in general as well as his speakers. I am a busy guy during the day, and tend to do my SoundStage! pickups, etc. either on the weekend or in a hurry at lunch. I met Israel at lunch one day and got on the topic of what I wanted to accomplish with this review. At the point we discussed the equipment I was going to use, Israel went blank and said, oh no, not the Arcam, Ive had problems with those, theyre too grainy and dont have enough in the bottom end. What a way to get a reviewer hyped about the product, dis his equipment! However, by the time we finished, I had to call my wife to let her know I was going to be late getting home from work, because despite the trashing of my Arcam, Israel was a pleasure to meet and talk audio with. Breaking equipment in is not my favorite task. I am one of those people who likes to open things up and start using them right away, so when I unpacked the Triumphs, I immediately started to run music through them to get them broken in as quickly as possible. Israel had suggested that the fastest method of breaking them is to crank em with heavy metal, the more the drivers move, the faster theyll break in, he assured me. At the first opportunity for an empty house, I put on one of my favorite annoy the neighbors CDs. It is a cheesy, moderate to poor quality CD called Waynes World Basement Tape. I picked it up at the CD store as a laugh, but it is one great mix of 70s classics like Thin Lizzys "Boys are Back In Town," "Alright Now" by Free, "Don't Fear the Reaper," and the list goes on. Maybe breaking equipment in isnt so annoying after all. I got my first taste of things to come with the Triumphs as they pumped out tunes from the Basement Tapes.. With only 8 hours of break in these things rocked, and showed no sign of letting up as the windows started to rattle. The bottom end was surprisingly authoritative for a mini-monitor, at least as much as my speakers which have 3 more inches of woofer diameter and probably 3 times the volume of cabinet. Apparently my wife called three times during this session... so thats what the flashing light on the phone means! I wasnt completely satisfied with the sound of the Signatures until they had at least 40 hours on them, which is considered a relatively quick break-in period. I should tell you a little about the aesthetics and design. These are a two-way first order crossover design with a minimum of parts to get in the signal path. The cabinet is made of specially selected 1 inch hardwood mdf and braced for a minimum of cabinet resonance. There is a 1 inch silk dome tweeter and 6.5 inch woofer and a 1 inch hole in the back of the speaker for porting. Israel has placed the tweeter and woofer as close as possible to create as close to a single point source as possible. 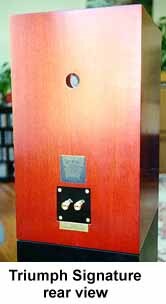 The speakers I used were finished in their premium mahogany veneer, very well finished indeed. I suspect Israel gave me these to show the improvements he has made to the finish of his speakers. Doug called the finish on the Conquest decent which I know was not what Israel wanted to hear. Thumbs up on these babies. The internal wiring is all Wire World cable and there is a single set of all metal, gold plated binding posts. No cheesy plastic nuts. Another thing that impressed me was the thoughtful way the items were packed. All too often I come close to dropping something before I even manage to wrestle it out of the box. The speakers (and matching stands) were packaged in such a way that the protective plastic turned into handles to help pull the product out of the box. Sometimes its the little things that you really notice. I used the Triumphs with Coincidents matching stands. The stands will set you back $295 per pair bringing the price as tested to $1544 ($1294 without the veneer). These are also made from 1 inch MDF and extend the dimensions of the speakers down to the floor, which gives them a floorstander look, one I happen to like. The stands are supplied with spikes that were easy to install and level. They have four dense foam pads to mount the speakers on and while I normally use fun-tak for speaker to stand coupling, I felt the foam pads provided a reasonable option. At high volume the stands were vibrating a small amount, but not to such an extent that I felt a need to try some other stands out. Israel claims that the stands are tuned to so that they cancel the resonances of the speakers better than sand-filled metal stands. I will say that the Coincident stands performed very well and I will leave it to you audition both to decide for yourself. Stands are a must with any speaker of this size, so include the cost of them when auditioning mini-monitors. After the break-in I started to pay a little more attention to what was going on with the sound on the Triumphs. To start, I thoroughly enjoyed the mids and highs on these speakers. The mids were very smooth and neutral and they didnt get shouty even at extreme volumes. Female voices were also sounding very natural, a sure sign of clean mids. Performers like Sarah McLachlin and Joni Mitchell have beautiful and voices with a fair bit of power to them. Once they start belting it out, the paint on the walls can start to peel if the upper mids are showing grain. The Triumphs handled these two performers at high volume with surprising aplomb. I have complained often of my over bright speakers and the highs on the Triumphs were a pleasure my ears. I have more windows than I care for in my listening room and often cover them with acoustic foam while listening to help the problem. I found that I really only needed one window covered with the Triumphs and this has managed to be a semi-permanent fixture... and an interesting conversation piece when friends are over. As you might expect from a mini-monitor, the imaging was excellent. I was getting pinpoint imaging from just about every speaker placement I tried. The soundstage became a little two dimensional when I moved them closer to the wall, but once they were a foot and a half or more out from the wall, they were at their best. With my equipment, you are not going to get holographic sound, but the effect was quite good. With the smoothness of the mids and highs that I first experienced, I thought detail might be the first victim with these speakers. Quite often, smoothness is gained at the expense of detail. This was not the case. The detail came through very well and I noticed that other things were happening with the extra information. My wife even commented that she thought that she could get a much better sense of the room acoustics of the recordings now, and that to me is a sure sign of good detail. Ambient information gives a much more real sense of space. The Cowboy Junkies Trinity Sessions is a good disk for getting a sense of acoustic detail if youre not sure what Im talking about because that recording oozes ambient information. That is not to say they are the most revealing speakers, but at this price point you are not going to be disappointed. I do much of my pleasure listening at lower volumes. It is usually after my daughter has gone to bed and my wife is watching bad TV. It is a time I take care not to incur the wrath of either and I have learned my lesson the hard way. My daughter is 18 months old and will sleep through the night if left relatively undisturbed, wake her up and shell mess up your nights sleep around 4:00 am. It is during these times that I found the Triumphs lacking in the bottom end at lower volumes compared to my speakers. I did a test with an Aragon 2004 amp and PS Audio 4.6 preamp, and the bottom end improved a little at the lower levels. However, it wasnt until I tried the new Cary SLI80 (80 watt integrated tube amp) that the bottom end reared its head at low volume. However, once at volume, the Cary lacked the slam of the solid state equipment. This suggests to me that the speakers are really conveying the nature of the amplification more than anything else. As I alluded to during break-in, the bass on the Triumphs was very good at normal to high listening levels on the Arcam. (even on the Arcam, Israel!) It was tight, solid and extended down to the 50 Hz range. The bottom end was entirely satisfying with very dynamic bass lines and kick drums on a wide range of jazz and rock. When the music was cranked, the small port at the back of the Triumphs created an interesting phenomenon. Once the speakers started pumping, there was a great whoosh of air out the back. The unusually small port makes the pressure of the air escaping from the port that much greater. It was great fun to crank em up and feel the gush of air. I realize this isnt an important aspect of a speakers performance, but it amused the hell out of me for some reason. What can I say? These speakers performed very well in all areas, excelled in the mids and highs, and cranked like there was no tomorrow. There are not many speakers out there that have a check list like that, especially at the price of the Triumphs. 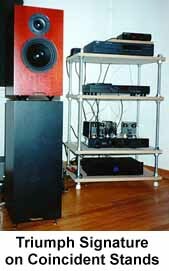 The obvious shortfall is the lack of bass extension, but that is characteristic of any speaker this size. Although I noticed differences in the bottom end on a few different amps, the speakers seemed to bring out the best in every amp I tried, even an entry level NAD receiver. Often you say a speaker does this well or that well, and then it becomes an exercise in matching them to the right equipment but you dont need to match these, they should sound good on just about everything.